China, America and a New Cold War in Africa? Is the conflict in South Sudan the opening salvo in the battle for a continent? Juba, South Sudan—Is this country the first hot battlefield in a new cold war? Is the conflict tearing this new nation apart actually a proxy fight between the world’s two top economic and military powers? That’s the way South Sudan’s Information Minister Michael Makuei Lueth tells it. After “midwifing” South Sudan into existence with billions of dollars in assistance, aid, infrastructure projects, and military support, the United States has watched China emerge as the major beneficiary of South Sudan’s oil reserves. As a result, Makuei claims, the United States and other Western powers have backed former vice president Riek Machar and his rebel forces in an effort to overthrow the country’s president, Salva Kiir. China, for its part, has played a conspicuous double game. Beijing has lined up behind Kiir, even as it publicly pushes both sides to find a diplomatic solution to a simmering civil war. It is sending peacekeepers as part of the UN mission even as it also arms Kiir’s forces with tens of millions of dollars worth of new weapons. While experts dismiss Makuei’s scenario—“farfetched” is how one analyst puts it—there are average South Sudanese who also believe that Washington supports the rebels. The US certainly did press Kiir’s government to make concessions, as his supporters are quick to remind anyone willing to listen, pushing it to release senior political figures detained as coup plotters shortly after fighting broke out in late 2013. America, they say, cared more about a handful of elites sitting in jail than all the South Sudanese suffering in a civil war that has now claimed more than 10,000 lives, resulted in mass rapes, displaced more than 1.5 million people (around half of them children), and pushed the country to the very brink of famine. Opponents of Kiir are, however, quick to mention the significant quantities of Chinese weaponry flooding into the country. They ask why the United States hasn’t put pressure on a president they no longer see as legitimate. While few outside South Sudan would ascribe to Makuei’s notion of a direct East-West proxy war here, his conspiracy theory should, at least, serve as a reminder that US and Chinese interests are at play in this war-torn nation and across Africa as a whole—and that Africans are taking note. Almost anywhere you look on the continent, you can now find evidence of both the American and the Chinese presence, although they take quite different forms. The Chinese are pursuing a ruthlessly pragmatic economic power-projection strategy with an emphasis on targeted multilateral interventions in African conflicts. US policy, in contrast, appears both more muddled and more military-centric, with a heavy focus on counterterrorism efforts meant to bolster amorphous strategic interests. For the last decade, China has used “soft power”—aid, trade, and infrastructure projects—to make major inroads on the continent. In the process, it has set itself up as the dominant foreign player here. The US, on the other hand, increasingly confronts Africa as a “battlefield” or “battleground” or “war” in the words of the men running its operations. In recent years, there has been a substantial surge in US military activities of every sort, including the setting up of military outposts and both direct and proxy interventions. These two approaches have produced starkly contrasting results for the powers involved and the rising nations of the continent. Which one triumphs may have profound implications for all parties in the years ahead. The differences are, perhaps, nowhere as stark as in the world’s newest nation, South Sudan. Starting in the 1980s, the efforts of an eclectic, bipartisan collection of American supporters—Washington activists, evangelical Christians, influential Congressional representatives, celebrities, a rising State Department star, a presidential administration focused on regime change and nation-building, and another that picked up the mantle—helped bring South Sudan into existence. “Midwife” was the word then-chair of the Senate Foreign Relations Committee John Kerry chose to describe the process. As the new nation broke away from Sudan after decades of bloody civil war, the United States poured in billions of dollars in humanitarian aid and pumped in hundreds of millions of dollars of military and security assistance. It also invested heavily in governmental institutions, and built infrastructure (constructing or repairing roads and bridges). It sent military instructors to trainthe country’s armed forces and advisors to mentor government officials. It helped to beef up the education sector, worked to facilitate economic development and American investment, and opened the US market to duty-free South Sudanese imports. The new nation, it was hoped, would bolster US national security interests by injecting a heavy dose of democracy into the heart of Africa, while promoting political stability and good governance. Specifically, it was to serve as a democratic bulwark against Sudan and its president, Omar al-Bashir, who had once harbored Osama bin Laden and is wanted by the International Criminal Court for crimes against humanity in that country’s Darfur region. When South Sudan broke away, it took much of Sudan’s oil wealth with it, becoming sub-Saharan Africa’s third-largest oil producer behind Nigeria and Angola. In taking those resources out of Bashir’s hands, it offered the promise of more energy stability in Africa. It was even expected to serve Washington’s military aims—and soon, the United States began employing South Sudanese troops as proxies in a quest to destroy Joseph Kony and his murderous Lord’s Resistance Army. That was the dream, at least. But like Washington’s regime change and nation-building projects in Iraq and Afghanistan, things soon started going very, very wrong. Today, South Sudan’s armed forces are little more than a collection of competing militias that have fractured along ethnic lines and turned on each other. The country’s political institutions and economy are in shambles, its oil production (which accounts for about 90% of government revenue) is crippled,corruption goes unchecked, towns have been looted and leveled during recent fighting, the nation is mired in a massive humanitarian crisis, famine looms, and inter-ethnic relations may have been irreparably damaged. Two years later, the China National Petroleum Corporation, with a 40% stake, is now the largest shareholder in the Greater Nile Petroleum Operating Company, the top oil consortium in South Sudan. It also leads another important consortium, the Greater Pioneer Operating Company. During the first 10 months of 2013, China imported nearly 14 million barrels of oil from South Sudan. That adds up to about 77% of the country’s crude oil output and twice as much as China imports from energy-rich Nigeria. While South Sudanese oil accounts for only about 5% of China’s total petroleum imports, the country has nonetheless provided Beijing with a new African partner. This was especially useful as a US and NATO intervention in Libya in 2011 created chaotic conditions, causing China to suffer heavy losses ($20 billion according to Chinese sources) in various energy and other projects in that country. In fact, just days before South Sudan plunged into civil war late last year, the deep-pocketed Export-Import Bank of China was reportedly preparing to offer the country $2 billion in loans and credit to build six key roads—including a 1,500-mile highway to link the capital, Juba, with Sudan’s main port—crucial bridges across the Nile River, schools and hospitals in every county, a hydropower plant, a government conference center, and a staple of Chinese construction schemes in Africa, a stadium. Recently, Chinese Premier Li Keqiang promised to expand cooperation with South Sudan in trade, agriculture, construction of infrastructure, and energy. Meanwhile, a separate $158 million deal to repair and expand the airport in Juba, financed by China’s Export-Import Bank and carried out by a Chinese firm, was announced. In addition, China has just shipped nearly $40 million in arms—millions of rounds of ammunition, thousands of automatic rifles and grenade launchers, and hundreds of machine guns and pistols—to Salva Kiir’s armed forces. 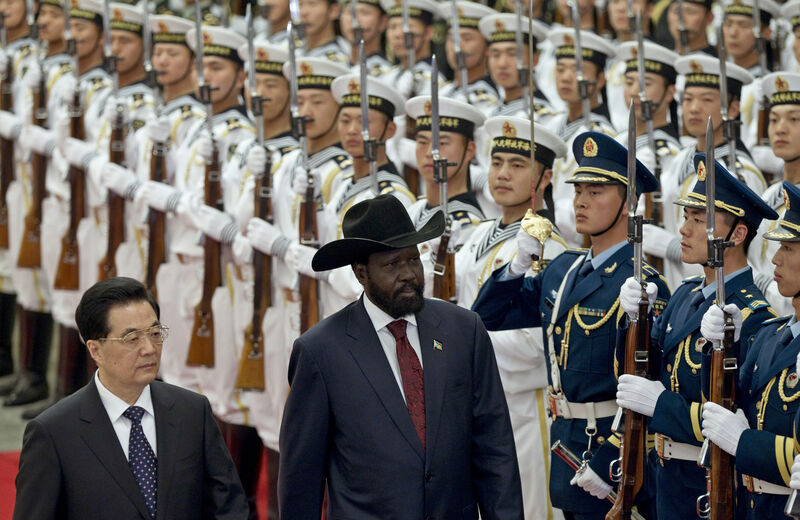 China’s interest in South Sudan is indicative of its relations with the continent as a whole. Beijing has long looked to Africa for diplomatic cooperation in the international arena and, with the continent accounting for more than 25% of the votes in the General Assembly of the United Nations, relied on it for political support. More recently, economics has become the paramount factor in the growing relationship between the rising Asian power and the continent. Hungry for energy reserves, minerals, and other raw materials to fuel its domestic growth, China’s Export-Import Bank and other state-controlled entities regularly offer financing for railroads, highways, and other major infrastructure projects, often tied to the use of Chinese companies and workers. In exchange, China expects long-term supplies of needed natural resources. Such relationships have exploded in the new century with its African trade jumping from $10 billion to an estimated $200 billion, which far exceeds that of the United States or any European country. It has now been Africa’s largest trading partner for the last five years and boasts of having struck $400 billion worth of deals in African construction projects which have already yielded almost 1,400 miles of railroad track and nearly 2,200 miles of highways. Resources traded for infrastructure are, however, just one facet of China’s expanding economic relationship with Africa. Looking down the road, Beijing increasingly sees the continent as a market for its manufacturing products. While the West ages and sinks deeper into debt, Africa is getting younger and growing at an exponential pace. Its population is, according to demographers, poised to double by the middle of the century, jumping to as many as 3.5 billion—larger than China and India combined—with working-age people far outnumbering the elderly and children. With its ability to produce goods at low prices, China is betting on being a major supplier of a growing African market when it comes to food, clothes, appliances, and other consumer goods. As Howard French, author of China’s Second Continent notes, “a variety of economic indicators show that the fortunes of large numbers of Africans are improving dramatically and will likely continue to do so over the next decade or two, only faster.” According to the International Monetary Fund, 10 of the 20 economies projected to grow fastest from 2013-2017 are located in sub-Saharan Africa. Last year, the World Bank attributed 60% of Africa’s economic growth to consumer spending. Beijing may even fuel this rise further by relocating low-skilled, labor-intensive jobs to that continent as it develops more skilled manufacturing and high-tech industries at home. This mass influx of Chinese pioneers has bred resentment in some quarters, as have heavy-handed tactics by Chinese companies that often ignore local labor laws and environmental regulations, freeze out local workers, mistreat them, or pay them exceptionally low wages. This, in turn, has led to instances of violence against Africa’s Chinese, as has Beijing’s support for unpopular and repressive governments on the continent. Such threats to the safety of Chinese citizens and business interests, as well as general political instability and armed conflicts—from Libya to South Sudan—have given China still another reason to build-up its presence. Traditionally, Beijing has adhered to a non-interference, “no strings attached” foreign policy—meaning no requirements on partner nations in terms of transparency, corruption, environmental protection, human rights, or good governance—and, as opposed to the United States, has avoided overseas military inventions. While it has long contributed to UN peacekeeping operations—the only kind of foreign intervention Beijing considers legitimate—China has generally operated far from the front lines. But things are subtly shifting on this score. In 2011, after the US-backed revolution in Libya imperiled 30,000 Chinese living there, the People’s Liberation Army coordinated air and sea assets in the largest evacuation mission in its history. And as the war in Libya destabilized neighboring Mali and a US-trained officer overthrew that country’s elected president, China sent combat troops—for the first time in its history—to join UN forces in a bid to stabilize a nation that the United States had spent a decade bolstering through counterterrorism funding. More recently, Beijing managed to broker an unprecedented arrangement to expand the mandate of the UN Mission in South Sudan. In addition to “protection of civilians, monitoring and investigating human rights abuses, and facilitating the delivery of humanitarian assistance,” according to Foreign Policy, “Beijing quietly secured a deal that will put the UN’s famed blue helmets to work protecting workers in South Sudan’s oil installations, where China has invested billions of dollars.” Although protecting the oil fields is akin to taking the government’s side in a civil war, the United States, France, and Great Britain backed the plan to protect oil installations under a UN mandate, citing the importance of the energy sector to the future of the country. In return, China will send an 850-man infantry battalion to bolster the UN mission,adding to the 350 military personnel it already had on the ground here. Yun Sun, a fellow at the Stimson Center and an expert on China’s relations with Africa, doesn’t see these recent developments as a militarization of China’s mission, but as a symptom of increased investment in the countries of the continent. “China cares more about security issues in Africa… due to its own national interests,” Sun tells TomDispatch. “It means China will contribute more to the peace and security issues of the continent.” And it seems that Beijing is now doing so, in part on America’s dime. US taxpayers, who fund about 27% percent of the cost of United Nations peacekeeping missions, are now effectively underwriting China’s efforts to protect its oil interests in South Sudan. Washington continues to pour aid into that country—more than $456 million in humanitarian assistance in fiscal year 2014—while China has pledged far less in humanitarian relief. Meanwhile, Juba has tied itself ever more tightly to Chinese energy interests, with plans toborrow more than $1 billion from oil companies to keep the government afloat as it battles the rebels. South Sudan seems emblematic of a larger trend in the race between Washington and Beijing in Africa. In 2000, China’s trade there passed $10 billion for the first time and has been growing at a 30% clip annually ever since. Nine years later, China overtook the United States to become the continent’s largest trading partner and, by 2012, its trade was nearly double that of the United States—$198.5 billion to $99.8 billion. While the United States recently announcedthat $900 million in unspecified “deals” with Africa will be unveiled at an upcoming US-Africa Leaders Summit in Washington, it will nonetheless continue to trail far behind China in terms of trade on the continent. “Recent engagements in Somalia and Mali, in which African countries and regional organizations are working together with international partners in Europe and the United States, may provide a model for future partnerships,” adds the QDR. But a look at those poster-child nations for US involvement—one in East and one in West Africa—instead provides evidence of America’s failings on the continent. In 2006, the Islamic Court Union (ICU), a loose confederation of indigenous Islamist groups seeking to impose order on the failed state of Somalia, defeatedthe Alliance for Restoration of Peace and Counterterrorism, a US-supported militia, and pushed the US-backed warlords out of Mogadishu, the capital. In response, the United States green-lighted a 2007 invasion of the country by Ethiopia’s military and secretly sent in a small contingent of its own troops (still operating in Somalia to this day). This succeeded only in splintering the ICU, sending its moderates into exile, while its hardliners formed a far more extreme Islamic group, al-Shabab, which became the key Muslim resistance force against al-Shabab, Washington’s Ethiopian proxies. Al-Shabab experienced a great deal of military success before being beatenback by the Ethiopians, troops from a US-supported Somali transitionalgovernment, and well-armed peacekeepers from the US-backed African Union Mission in Somalia (AMISOM). These forces were, from 2009 onward, joined by proxies trained and armed by US-ally Kenya, whose own army invaded the country in 2011. Their forces in Somalia, eventually foldedinto the AMISOM mission, are still deployed there. On the run and outgunned, al-Shabab responded by threatening to take the war beyond its borders and soon began to do so. In other words, what started as a local Islamic group achieving, according to a Chatham House report, “the unthinkable, uniting Mogadishu for the first time in 16 years, and reestablishing peace and security,” quickly became a transnational terror organization in the wake of the Ethiopian invasion and other acts of intervention. In 2010, al-Shabab carried out a bomb attack in Uganda as a punishment for that country’s contribution to the African Union mission in Somalia. In 2011, it launched an escalating series of shootings,grenade attacks, and bombings in Kenya. The next year, the formerly Somalia-centric outfit further internationalized its efforts as one of its leaders pledged obedience to al-Qaeda chief Ayman al-Zawahiri. In 2013, the group carried out a devastating attack on the Westgate Mall in Kenya that killed 67. Earlier this year, al-Shabab extended its reach even further with its first-eversuicide attack in Djibouti, the tiny Horn of Africa nation that contributes troops to AMISOM and hosts French troops, a key European proxy force for Washington on the continent, as well as the only avowed US base in Africa. “The attack was carried out against the French Crusaders for their complicity in the massacres and persecution of our Muslim brothers in the Central African Republic and for their active role in training and equipping the apostate Djiboutian troops in Somalia,” read an al-Shabab statement that alsohighlighted a US-backed French military mission in the Central African Republic. In the months since, the group has repeatedly launched murderous assaults on civilians in Kenya and continues to threaten Uganda and Burundi, which also contributes troops to AMISOM, with future attacks. It has even gained regional affiliates, like Al-Hijra, an underground group accused of recruiting for al-Shabab in Kenya. After 9/11, on the opposite side of the continent, US programs like the Pan-Sahel Initiative and the Trans-Saharan Counterterrorism Partnership, pumped hundreds of millions of dollars into training and arming the militaries of Mali, Niger, Chad, Mauritania, Nigeria, Algeria, and Tunisia, again in order to promote regional “stability.” While US Special Operations forces wereteaching infantry tactics to Malian troops, the Chinese were engaging very differently with that West African nation. Despite Mali’s lack of natural resources, China constructed a key bridge, a hospital, a stadium, a major government building, several factories, miles of highways, and a $230 million waterworks project. The US wasn’t, however, left totally out in the cold on the construction front. The State Department’s Millennium Challenge Corporation (MCC), for example, spent $71.6 million to expand the Bamako Airport. The contract, however, went to a Chinese firm—as did many MCC contracts across Africa—because American companies were uninterested in working there despite guaranteed US financing. What Washington was trying to build in Mali came crashing down, however, after the United States helped topple Libyan dictator Muammar Gaddafi in 2011, causing that country to collapse into a morass of militia fiefdoms. Nomadic Tuareg fighters looted the weapons stores of the Gaddafi regime they had previously served, crossed the border, routed US-backed Malian forces and seized the northern part of the country. This, in turn, prompted a US-trained officer to stage a military coup in the Malian capital, Bamako, and oust the democratically elected president. Soon after, the Tuareg rebels were muscled aside by heavily-armed Islamist rebels who began taking over the country. This, in turn, prompted the United States to back a 2013 invasion by French and African forces which arrested the complete collapse of Mali—leaving it in a permanent state of occupation andlow-level insurgency. Meanwhile, Islamist fighters and Gaddafi’s weaponswere scattered across Africa, contributing to greater instability in Nigeria andLibya, as well as increased threat levels in Chad, Burkina Faso, Ghana, Guinea, Niger, Senegal, and Togo. It evidently also spurred an audaciousrevenge attack in Algeria that left more than 80 dead and an assault on a French-run uranium mine and a nearby military base in Niger in which at least 25 people were killed. Despite this, Washington dispatched personnel to Africa in 2002 and began pouring money into counterterrorism efforts. Since then, the United States has steadily increased its military footprint, its troop levels, and its missions on the continent—from night raids in Somalia and kidnap operations in Libya to the construction of a string of bases devoted to surveillance activities across the northern tier of Africa. For all the time spent training proxies, all the propaganda efforts, all the black ops missions, all the counterterror funds, the results have been dismal. A glance at the official State Department list of terrorist organizations indicates that these efforts have been mirrored by the growth of radical militant groups, including the Libyan Islamic Fighting Group added in 2004, al-Shabab in 2008, Ansar al-Dine, Boko Haram, Ansaru, and the al-Mulathamun Battalion in 2013, and Libya’s Ansar al-Shari’a in Benghazi, and Ansar al-Shari’a in Darnah, as well as Ansar al-Shari’a in Tunisia, and the Egyptian militant groupAnsar Bayt al-Maqdis, all in 2014. And that’s hardly a full list. Not included are various terror organizations, rebel forces, separatist movements, armed groups, and militias like the Movement for Unity and Jihad in West Africa, fighters from the group formerly known as Seleka and their rivals, anti-balaka militiamen in the Central African Republic, Taureg separatists of Mali’sNational Movement for the Liberation of Azawad, the Congolese Resistance Patriots, Burundi’s National Forces of Liberation, and others. Over these years, as the United States has chased terror groups and watched them proliferate, China has taken another route, devoting its efforts to building goodwill through public works and winning over governments through “no strings attached” policies. “Our goal is not to counter China; our goal is not to contain China,” President Obama said during a trip to Asia earlier this year. In South Sudan, as in Africa as a whole, America seems increasingly unable to even keep up. “On certain levels, we can’t or won’t compete with China,” says the Fund for Peace’s Patricia Taft. “China will continue to eclipse us in terms of economic interests in Africa.” The US is, however, still preeminent in the political sphere and that influence, she says, will continue to trump anything China can currently offer. The question is: For how long? Benediste Hoareau, head of political affairs for the East African Standby Force—a rapid intervention force in-the-making, consisting of troops from the region’s militaries—expresses similar sentiments. He believes in the often repeated axiom of finding African solutions to African problems and says that the foreign powers should provide the funds and let African forces do the fighting and peacekeeping in South Sudan.